1. Make the coffee to give 150ml strong espresso and leave to cool. 2. Meanwhile, place the cream and condensed milk in a large bowl and using an electric whisk, beat for 5 minutes or so until the mixture forms soft peaks. and a little more chopped chocolate. 4. Freeze overnight until firm. 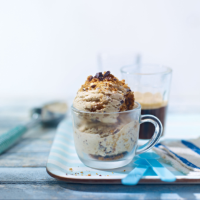 Transfer to the fridge for 15–20 minutes before scooping and serving in espresso cups. the side to pour over.